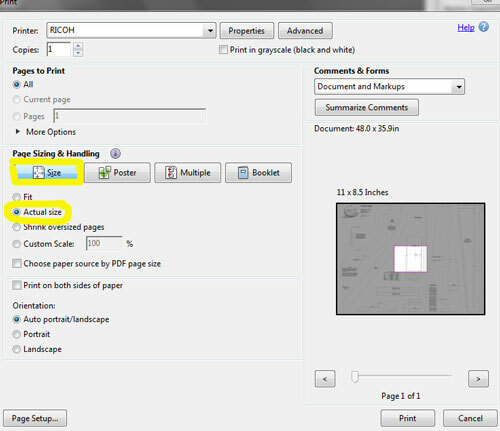 How to Print Digital Blueprints at Home. All of our blueprints are full-size and thus meant to be printed on large format paper. Most of you won't have access to a large format printer so you will have to print these at home on regular 8.5 x 11 paper. The downloaded blueprint will be a PDF and can be printed full size at home using the free Adobe Reader Software. You probably already have this installed on your computer. If not, just click the link above. 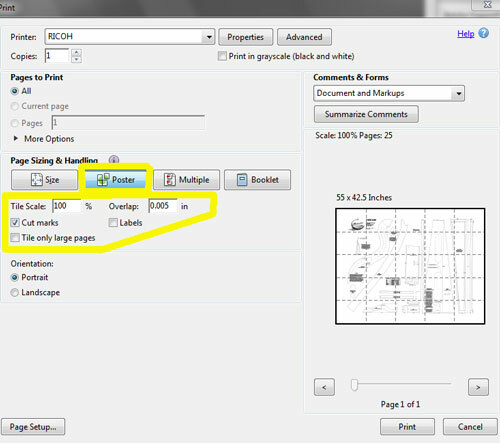 To print these plans at full size, you use a feature called Poster printing. In older versions of the software this might be called Tiling. Here are couple of screen shots using the Adobe Reader XI (current March 2015). 1. Make sure that you select "Actual Size" in the size tab. 2. Click the "Poster" tab. Make sure the "Tile Scale" is 100%. The default "Overlap" should work. Check the box to include Cut Marks. If you check the box marked "Labels" the pages will be numbered. This is probably a good idea for larger plans. 3. That should do it. Go ahead and print your blueprint. Trim the sheets by following the cut marks and tape together.